Continuing our tradition of advancing the state of state-of-the-art, the Montefiore Einstein Center for Cancer Care introduces the Center for Radiation Therapy. Our state-of-the-art 15,000 square foot facility offers the most innovative and comprehensive array of radiation therapy services available in the New York Metropolitan Region. Best of all, the expertise of our renowned team of radiation oncologists, physicists, nurses, radiation therapists and staff ensures precision, efficiency, empathy and compassion. 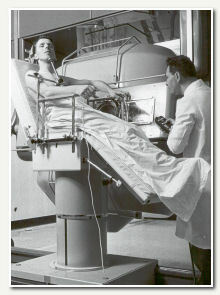 Montefiore was the first hospital in the United States to employ the betatron in the battle against cancer. In its time, the betatron was considered precise, sensitive and a symbol of modern medicine. Montefiore continues its tradition of defining the leading edge by being the first hospital in the New York Metropolitan region to use Guided Radiation Therapy with an on-board imaging device. Montefiore's radiation oncology department was one of the first of its kind in the U.S. and was instrumental in the development of high-energy irradiation, electron beam irradiation and brachytherapy (radioactive implantation). Today, we continue to expand the realm of the possible by developing innovative technologies and embracing the latest treatments in radiation oncology. Offering state-of-the-art treatment modalities, the extraordinary, new Center for Radiation Therapy brings you the very best in comprehensive radiation services. Here, Montefiore physicians deliver a wide range of sophisticated internal and external beam radiation options not available in most radiation centers, including real-time treatment planning through the use of image-guided radiation therapy. Patients, as always, are treated with the greatest of care, compassion and respect, which is why we pledge to see all new patients within 72 hours of a physician referral. In addition, our patients are able to complete their cancer treatment by conveniently accessing Montefiore's Ambulatory Clinical Oncology and Infusion Center-located just a short walk away. Our internationally recognized team of radiation oncologists, physicists, nurses and radiation therapists applies decades of expertise in developing the right course of therapy for each patient. Partnering with surgeons, medical oncologists and other specialists, they offer the most comprehensive, multidisciplinary approach to cancer treatment. The Newest Technologies - A Full-Spectrum of Care. The Montefiore Einstein Center for Cancer Care is using all the latest developments in radiation oncology to provide your patients suffering with cancer the most exceptional care. 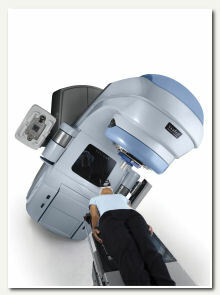 For cancers of organs that move with respiration, IGRT produces a beam that precisely follows tumor motion. Physicians can see and analyze tumors in real time, offering them unparalleled tumor control and sparing of normal tissue. Computed tomography (CT) produces 3-D images of the patient anatomy. 4D CT introduces the 4th dimension—time—to produce a 3-D movie loop of the tumor moving with patient breathing. By tracking the patient's breathing pattern, the system automatically gates (or applies) the radiation beam on only when the tumor falls within the planned treatment field. The patient breathes naturally and remains comfortable throughout. This highly precise radiation system delivers carefully calculated and precisely sculpted beams of highly focused radiation directly into the tumor, allowing the delivery of maximum dosage while sparing healthy tissue. Using on-site computers to create individualized treatment plans, the physician places catheters or radioactive seeds in or near the tumor. This advanced procedure delivers a high dose of radiation directly to the tumor while reducing exposure to surrounding tissue.